The fried gnudi, or ricotta dumplings, come three to an order. 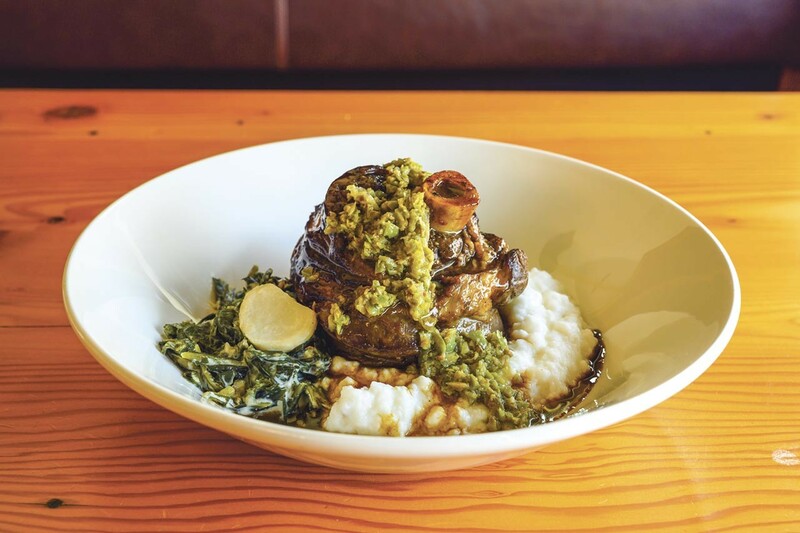 The lamb shank with polenta, turnips and turnip greens was well-composed. It took more than six years, but Greg Poulios and Mark Louie finally did it. In October 2012, the two childhood friends and founders of Creekwood Restaurant made an offer on the building on Sacramento Street in South Berkeley, which now houses the restaurant. The building was once a bike shop and essentially had to be rebuilt; the only part of the building that's original is the roof. They were hesitant about the buying the building because it was in such bad shape. But the two had talked about starting their own restaurant for years, ever since they worked together at Zuppa in San Francisco. So when they got the chance to buy the property, they decided to take the leap. You'd never recognize the shabby former bike shop at Creekwood Restaurant today. It boasts an elegant gray façade that's so minimalist that I couldn't find a sign outside announcing the name of the restaurant. (The name, by the way, comes from the fact that there's a creek running underneath the restaurant.) Inside, the place now contains a custom-built wooden interior and subtle decorative touches, like nearly century-old lamps from a former ammunition factory in Wisconsin. It's inviting and warm — literally, because diners are immediately greeted at the door by the heat of the pizza oven. There's an open kitchen where guests can see executive chef Liam Bonner, formerly of Zuppa and Globe, along with the rest of the team at work. The menu is California-Italian, with some dishes leaning Californian and others more Italian. Poulios tries to stop by every table, say hello, and offer guests samples of wines offered by the glass, a welcome touch I haven't seen in many other mid-end restaurants. After I tried a couple wines and settled on a glass of Sicilian red, it was on to the appetizers. 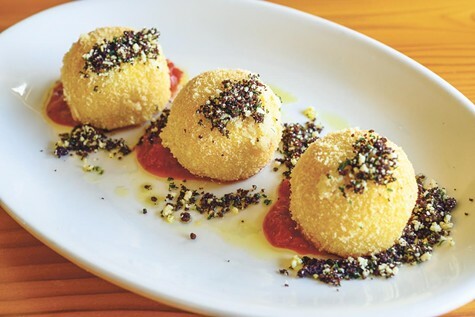 The fried gnudi, or ricotta dumplings, arrived three to an order, each dumpling plated with a dollop of marinara sauce and topped with Parmesan cheese and brown butter solids. The crust surrounding the gnudi was delightfully thin and crisp, and the cheesy insides were fluffy and creamy, with a hint of citrusy flavor. Equally good was an appetizer of grilled squid, served with fingerling potatoes, mustard greens, and toasted olive aioli. The grilled flavor of the tender squid, which Poulios said is locally sourced from Monterey Bay, shone through. The potatoes were crunchy on the outside and creamy on the inside. The olive aioli delivered a salty, acidic punch of flavor, while the bitter mustard greens added complexity. Next was a straightforward appetizer of three meatballs in marinara sauce with garlic bread on the side. I couldn't find any faults with the garlic bread or the marinara, but the meatballs, which Poulios said are made with beef, pork, and ricotta, were too dense for my liking, and the $16 price tag — the most expensive of the appetizers that night — seemed steep for the portion size. After walking past the inviting heat of the pizza oven, I had to try one of the Neapolitan-style pizzas. I went for a white pizza topped with speck, a cured Italian ham similar to prosciutto, along with artichokes, Gaeta olives, pecorino cheese, and egg yolks. I liked how the speck crisped up in the oven, adding the kind of crunchiness and richness you'd expect from bacon. I also appreciated the fact that the pizza included two runny egg yolks. But with a lot of salty toppings like speck, olives, and Pecorino, the pizza felt a little one-note. Though I wish it was noted on the menu, most pastas are made fresh in-house — except for the cameroni, which is a tube-shaped pasta made fresh by Phoenix Pastificio in Berkeley. It came served with pork ragu and broccolini, then topped with pecorino cheese. The pasta was cooked to a perfect al dente, and I liked the fact that the broccolini was lightly cooked so it maintained its bright green color and crunchy texture. I preferred the risotto with Kurobuta pork short rib. The risotto was buttery and rich, and came out an unexpected vibrant green color thanks to parsley oil. The fried shallots added depth and texture, and the pork, though served off the bone, was juicy and tender, though a little oversalted. The grilled half-chicken entrée was crisp around the edges, yet juicy on the inside, and I loved the melánge of seasonal veggies that came with the panzanella. The fried drumette that came with the breast and thigh was a pleasant surprise, but I was not-so-pleasantly surprised to see that the rest of the wing, and an entire drumstick, were left off of what was listed as a half chicken. The lamb shank with polenta, turnips, and turnip greens was a well-composed entrée; the rich lamb and cheesy polenta was countered by the earthy bitterness of the turnips and their greens, while a green salsa on top of the lamb complemented the flavor of the meat. The polenta was very good in terms of flavor, but the texture was thick and gluey. Otherwise, this would be a standout dish. Speaking of standout dishes, a humble side of farro served with Brussels sprout leaves, apples, squash, and pumpkin seeds turned out to be one of the best dishes I tried. The farro was warm, buttery, and nubby, while the warm apples and squash added comforting flavors. For dessert, a house-made carrot cake with an exceptionally tasty cream cheese frosting, candied ginger, and a scoop of toasted almond gelato from Almare was a satisfying end to the meal, and the portion was big enough to share. While the menu at Creekwood needs a few tweaks to reach its full potential, the service is attentive and accommodating, and you can tell that the restaurant's founders are passionate about what they're doing. Outside of Creekwood, both of them have full-time jobs: Poulios works in catering at UC Berkeley, and Louie works as an elementary school teacher. "It's a labor of love, you know?" Poulios said. And despite the risks involved with opening a new restaurant — particularly in this area of South Berkeley, where sit-down restaurants are scarce — Poulios is glad he took a chance on Creekwood.